Well, 2012 is here. I am not going to post a 2011 year in review. You have a well categorized list of archived blogs on the right toolbar if you want to see what I blogged in 2011. I believe this is the time for looking forward, not back....or at least I am not feeling very whimsical today. OK, I am afraid some people may not pick up on the dry humor in the last two sentences. Trust me, I appreciate anyone who takes the time to find and read my blog. So back to 2012. This year is already off on the right foot. I was added to the Deep Creek Lures pro-staff a few weeks ago and could not be more excited to team up with my favorite plastics company. On top of that, I have some other opportunities in front of me currently that I am quite giddy about. And soon (next month?) 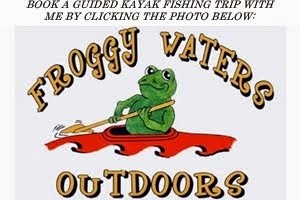 a piece that I helped contribute to will come out in Kayak Angler Magazine. The year also got off on the crazy foot....I bought an A-rig. Actually, I bought 2. In 3 months, when I either a) can't catch anything on them or b) they get outlawed, I will probably sell them for 1/8th of what I paid...and I got the cheap ones. If I buy a pedal powered kayak this year, it will officially be a sign of the apocalypse (sorry Mayans, there is no chace of that happening). I am also going to change it up a bit this year. You may have already noticed that I dropped the "blogspot" from my web address. It was just holding me down. I also switched up the title a little and changed some graphics. And you are going to see more videos and pictures on this blog (and over at HOOK1) including a 9 (or so) part web series detailing my quest for....well, I gotta leave you hanging. But I promise it will be good. I also want to do a little more guiding and a little less competitive fishing. In fact, I haven't the foggiest idea when any tournaments are taking place this year, which is why I haven't updated the "Tournaments" page on my site. However, Wild Bill Kohls and I will be on Belews, March 3rd in pursuit of a healthy 8 bass limit that will undoubtedly lead to county wide fame and fortune. So please, keep stopping by to read. In fact, share it with your friends, post it on Facebook, or even recommend it to rich, famous people who want to back a kayak fishing TV show. Better yet, share it with big wig execs looking for a full time writer/videographer/photographer willing to do all sorts of destination pieces for their publication. My next blog is most likely going to be a report as well as a review of a new yak I was asked to demo. Until then, tight lines!